Looking for hoist rings? Material Handling Solutions is the place. We carry a large variety of durable hoist rings. Hoist rings are used for various lifting devices such as gantry cranes, jib cranes etc.Â They are used in many different industrial and construction applications. Our hoist rings are constructed of high strength forced alloy steel.Â The range of movement on our hoist rings is 180 degree pivot and 360 degree swivel. 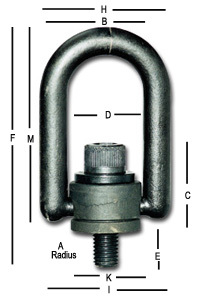 These swivel hoist rings maintain their load capacity when loads are at various angles. Our hoist rings are available in a variety of capacities starting at 1000 lbs to 24000 lbs. For larger capacities, metric sizes, stainless steel and non-standard bolt sizes give us a call. We will get you a quotation. Please check our gantry cranes, jib cranes and hoists.